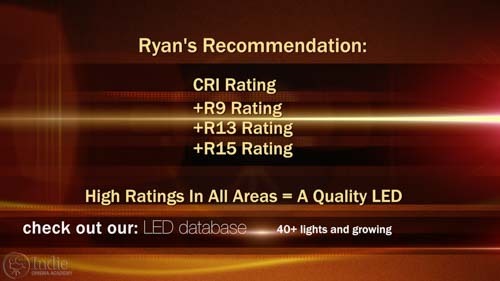 Summary: Did you know that with an LED, not only is a high CRI rating misleading, but it might be totally irrelevant? 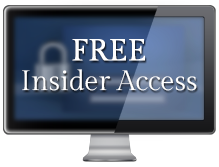 In this video I’ll show you why and what to do about it. 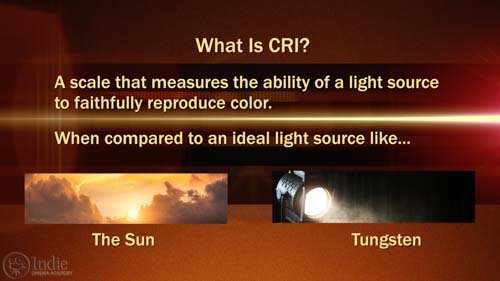 The Color Rendering Index, or CRI, has been the standard for measuring the color accuracy of a light source for a long time. In fact, it holds so much weight that many LED manufacturers tout their high CRI ratings to claim their lights are high quality. But did you know that with an LED, not only is a high CRI rating misleading, but it might be totally irrelevant? In this video I’ll show you why and what to do about it. Before I dive into the whole CRI issue, you may be wondering why this matters in the first place. The answer is simple: as filmmakers we work in a color critical medium. A majority of projects involve filming people, and skin tone is one of those memory colors that we all intuitively know how it should look. So it is crucial that skin tones look good on camera. Even if there are no people filmed in a project, companies have a lot vested in the color of their brand and products, and so they expect these hues to be reproduced accurately. And if we’ve gone to the trouble of art directing our projects, then wouldn’t we want our props, wardrobe, and sets to look their best? 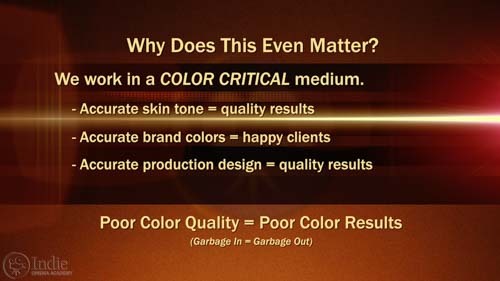 But, none of that can happen if we are using a light source that can’t deliver color critical results in the first place. So what is CRI? It’s a scale that measures the ability of a light source to faithfully reproduce the colors of various objects when compared to an ideal light source. Sunlight and tungsten bulbs are two examples that produce ideal light. The CRI scale ranges from 0 to 100. The larger the number, the more faithful and color accurate the light source will be. The CRI scale is pretty simple to read and understand. Lights with a CRI below 30 are basically useless. CRIs from 30 to 60 mean that the light has a hard time getting many color right. From 60 to 70, it can get some colors right. Lights with CRI between 70 – 90 mean that most of the colors are right. Above 90 and the light is close to perfect. It used to be that all you really needed to know for film, video, and photography was whether or not a light had a CRI rating over 90. But with the advent of new lighting technologies like LED, all that has that changed. The difficulty with CRI is that it isn’t measuring all colors of the spectrum. 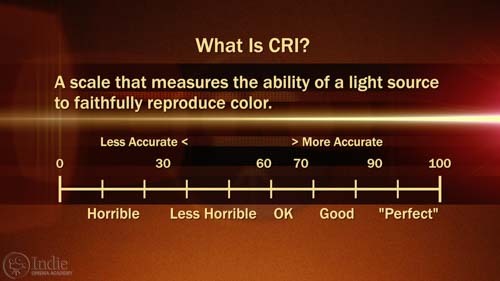 Instead CRI is the average of eight different Munsell test colors as defined by the International Commission on Illumination (CIE). They chose these specific colors because they are representative of the rest of the color spectrum since they are relatively low in color saturation and are fairly evenly distributed. Sounds pretty good, right? 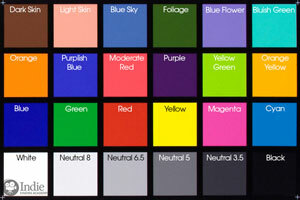 Unfortunately the eight color samples only work well for broad or full spectrum light, meaning a source that emits light across the entire range of visible light. A light source that is not full spectrum has gaps and spikes resulting in some colors being poorly rendered. Depending on how an LED is made, it most likely won’t be full spectrum, so it too will have gaps and spikes. If those gaps and spikes don’t fall on any of the eight colors measured by CRI, the light can have a high CRI rating but still render colors poorly. So what are we to do if CRI no longer tells the whole story? Let’s take a look at three different solutions. In 2012, the European Broadcasting Union, or EBU, approved the Television Consistency Lighting Index, or TCLI. 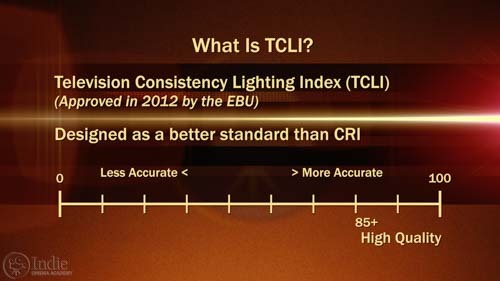 TCLI was developed to overcome the shortcomings of CRI with light sources like LEDs. Like CRI, TCLI is based off of a scale of 0 to 100, with the best light sources being above 85. How TCLI differs from CRI is that TCLI samples the 24 color patches on a Macbeth Chart . Sounds pretty impressive, right? That’s three times more colors than CRI, so it must be better. And TCLI is definitely better than CRI. If you buy an LED that has a high TCLI rating, one that is 85 or above, then chances are you’ll get great results from it. Unfortunately TCLI may not be the standard we should be adopting going forward. 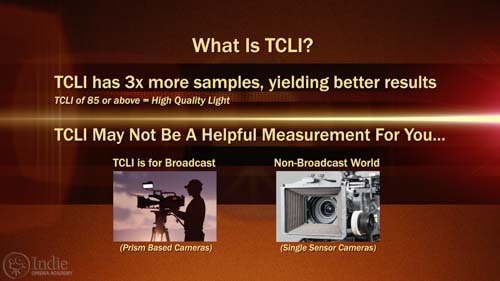 TCLI was developed for broadcast cameras that employ prisms, which is important to consider. Prism based cameras respond to light differently than non-prism based cameras. Outside the broadcast world, most people use single sensor CMOS cameras, which don’t use a prism. Does that make TCLI irrelevant? No, it just makes it less useful for those who don’t shoot on broadcast cameras. Wendy Davis and Yoshi Ohno of the National Institute of Standards and Technology have been working on another system to evaluate the accuracy of a light source. 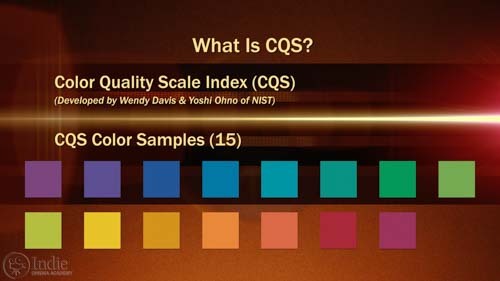 The Color Quality Scale, or CQS, samples 15 colors on the Munsell color wheel. Like CRI and TCLI, the CQS scale goes from 0 to 100, with 100 being ideal. In addition to sampling nearly twice the colors as CRI, CQS also takes into account human preference. For example, psychological studies have revealed that there are preferred color shifts in objects like skin tone. People prefer the look of caucasian skin tone when it is redder and more saturated. Also people prefer green grass and leaves when they are less yellow and slightly more saturated than in real life. So rather than penalizing a light for rendering these colors that way, CQS attempts to integrate that into their measurement. 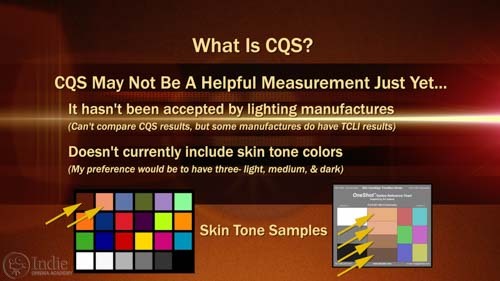 But while CQS is better than CRI because of its wider color sample, I’m not convinced that it is a helpful scale to use right now for us in the film industry for two reasons. First off, it has yet to be implemented in any real way by lighting manufactures, so comparing results isn’t possible. Meanwhile some manufactures are starting to publish TCLI results. More importantly, the color samples chosen for CQS are missing at least one key sample in my opinion: various shades of skin tone. For those of us filmmakers, knowing how accurately a light reproduces multiple shades of skin tone is crucial for the work we do. But CQS shows a lot of promise, and I look forward to see how it matures as a standard. So CRI doesn’t work, TCLI is great for broadcast, and CQS is still maturing. What are we to do until there is a reliable standard? Well, for now, I’d recommend looking at Extended CRI. 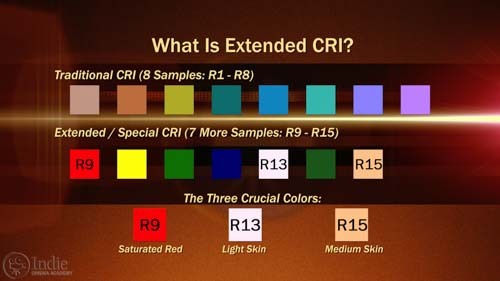 While the traditional CRI scale doesn’t go far enough with it’s eight color samples, there is actually an extended CRI range that goes to up to 15 colors. And there are three very important colors that are included in these additional seven samples, the first of which is R9, a saturated red. It is actually quite difficult for an LED light to emit a lot of red. And since our mind’s eye knows when red is really red, it’s important to get it right, especially since it is a key component of skin tone. So if you want good skin tones, you need a good R9 reading. The two other important colors are R13, which is a light skin tone, and R15, which is a medium skin tone. You might be asking why there isn’t a dark skin tone reading. Well, I don’t have a clue; I think there should be one. But for now, R13 and R15 are the two skin tone readings that are part of the extended CRI range and will help us gauge how well a light renders skin tone. Until a more helpful standard is agreed upon, what matters to me right now is the CRI rating plus the rating for R9, R13, and R15. The higher these ratings are, the more confident I am that the light will help me render all of my colors correctly, especially skin tones. The problem is that not many manufacturers list their R9, R13, and R15 values. And for good reason: those are hard colors to reproduce well. Recently, I used my Sekonic C-700 –designed with this new lighting technology in mind–to create a database of well over 40 lights. As I test more lights, I will add them to the database. So before you go out and buy your next light, you might want to check out our database to see the readings for yourself. If you want accurate colors, and you want great looking skin tones on your projects, stop relying on CRI to tell you the quality of the light. It’s not giving you the full picture in today’s world of lighting. To know how a light is really going to perform, you have to measure it using a color meter specifically designed for LEDs. How have you been coping with this ever changing lighting technology and lack of clear measurement standards? Do you have another suggestion for determining the color quality of a light? I want to know, so leave a comment below. And if you have any questions, ask away, and I’ll be sure to respond. Yes you are right about the CRI CQS TLCI and many other standards that are trying give a numeric value to a light source. However we can evaluate how a light performs on a video camera and measure those results. I have worked in film and video for many years and matched a variety of light sources. My method relies on the DSC Labs chroma dumonde chart and a vector scope. I can match the light source to the dominant source by seeing where the source I am trying to match to the camera line up is off in which vector. Since the video camera 4:2:2 or 4:4:4 is converting lighting into an electronic signal that can be measured for luminance and chroma values I find this the best method when looking at light sources and matching them. I showed an example of an led variable unit matching to tungsten on my Linkedin account here. In this article I talk about my opinion on Lighting terms not related to how the camera sees. Another issue you may want to talk about is CCT and Kelvin since the two are not the same yet manufacturers want to make them appear to be the same. There is a simple on camera chart made by dsc labs for simple on camera matching of sources. Here is my article on that chart here. I am glad you are trying to clear up misconceptions about numeric values in your video as they relate to the camera. Some great thoughts, Brad. Your articles are a great resource for people. Going the vector scope route gives a lot of good matching information. Also if a DP uses the vectorscope in their non-linear editor, it would be an inexpensive alternative to a color meter. That set-up would be time intensive, but gives valuable info on each light. I am waiting for the colour meter that will do all of this and take into consideration the image sensor I am using. To my knowledge the c700 bases it white balance correction mode display option is referenced to a DSLR camera. Colour correction on set is still needed as fixing it in post us not the most economical method as one of your video shows. However knowing what portion of the spectrum you need to reduce as per the camera’s perception is best done with the vectorscope from my experience. As for the C700 and DSLR cameras, it is my understanding that the C700 is not calibrated for DSLR cameras. It uses it’s own CMOS sensor to provide it’s own readings and results. It’s not trying to match a DSLR or any other camera for that matter. (Most cameras these days are CMOS). Personally, I think the most economical, and realistic approach for the majority of people, and for our members on this site, is to spend a day testing prior to the shoot. That way the camera can be dialed in with the main light source being used without tieing up / slowing down the whole production. But the reality is these days budgets and schedules get squeezed tight, and the majority of work that I do- even the high end commercial work for companies like Adidas, we don’t have that luxury. So spending some time prior to the shoot, seems to be the best option in my opinion. That way the only time & equipment cost is for the camera, a light or two, and one or two crew members. Which is a lot more affordable then a whole production crew on the day of the shoot. Do you have any thoughts or suggestions on how to balance smaller crews with still getting things right in camera on the day of the shoot? What about TM-30-15? 99 samples, uniformly distributed, fidelity index and gamut index plus detailed hue and saturation info. It is not yet a standard but it is being evaluated (as the CQS you mention). Yes, TM-30-15 is another option. The more samples the better since it will identify troublesome areas. 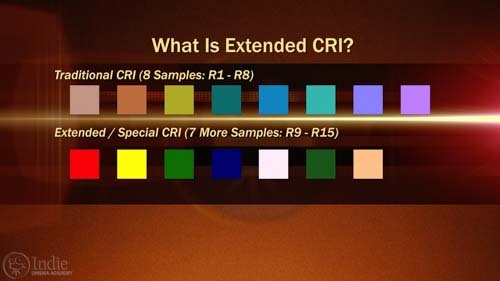 With the standard CRI, only 8 colors are measured, none of which are saturated. And the nature of averages disguises bad values as long as the other values are good. Hopefully a high quality standard is set in place soon. But getting manufacturers to report that standard is a whole different issue. HI Tim , very wonderful article , just i want to know the name of the colors in the CRI, TLCI ,Extended CRI systems . White, Neutral 8, Neutral 6.5, Neutral 5, Neutral 3.5, Black. Dear Tim , thank you very much for helping me , I have another question when you want to asses by TCLI and CRI which color meter you prefer to use , Can we use Minolta IIIf ? what is your recommendation Regard TCLI and CRI assessing ? We use the Sekonic C700 and the Asensetek Lighting Passport to take our color readings. However, both of these are on the more expensive side. I have not used the Minolta IIIf color meter. From reading about it online and looking at the manual it seems to be used more by photography people than video people since it only suggests filters to correct for color. It won’t be able to assess TLCI and CRI. This was very instructive. I just took delivery of a Kino-Flo 4 bank light, because everything I’ve read says that Kino-Flo does well on R1 through R15 inclusive. So I fired up the Kino-Flo (daylight balanced tubes), let it run for 15 minutes, and then measured it with a Sekonic 700. Averaged over 10 measurements, the R9 reading was around 73 – is that typical? I have not measured Kino-Flo’s current daylight balanced tubes, but fluorescent bulbs tend to have a lot of spikes causing certain colors to not render well. With KinoFlo I would have expected better R9 values. I created a new soft light called the Puck Lite with a high red value. http://www.pucklite.com gives good skin tones. Thanks Brad. Measuring a lights quality based on how the camera sensor actually sees it makes the most sense. The quality of the light isn’t the only thing being tested that way; the quality of the sensor is also part of the game. That being said, since there are millions of combinations between lights and camera sensors, it becomes an impossible task for anyone to report on the quality of lights. For this reason the PRI system has limited value. I do highly recommend people testing their lights against their camera sensor using the method you suggest, so that they can get the best color possible on their projects. Actually if PRI were to be implemented into a meter it would be good. As I said the misinformation about LEDs is wide spread with manufacturers to promote their products. Extended CRI is represented by CRI (Re)? Correct. CRI (Ra) is the average of the R1 through R8 values, while CRI (Re) is the average of the R1 through R15 values. In conversation, “CRI” often means only CRI (Ra), while “Extended CRI” refers to CRI (Re). This may sound like a stupid question, but I’m going to ask it anyway. I know you established that a CRI of 90+ is traditionally thought to be a high performing light. Now that we know CRI Ra isn’t reliable, when looking further into individual values, what would you say the minimum R9, R13 and R15 values should be for a “near perfect” performance in rendering skin tones? Would a light with a flat 90 score for those colors be considered a light worthy of a Hollywood caliber production? That’s actually a very important question. I’d say an R9 value of 90 is probably all you need. If you are looking for “near perfect,” then aim for an R9 above 95. Current LED lights don’t struggle with decent R13 and R15 values, so I’d expect them to at least be in the 95 range. As for your “flat 90″ score” for R9, R13, and R15, I’d say if the R9 was able to achieve 90, then the rest of the values should be much higher. 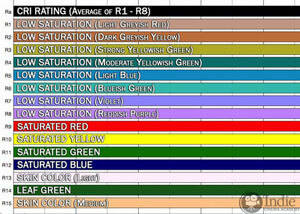 This is because the two values that LEDs struggle the most with are R9 (saturated red) and R12 (saturated blue). Many Hollywood caliber productions use lights that have “flat 90 scores,” and some even a bit lower. I’ve seen plenty on big productions that have R9 values in the low 80s. Of course it all depends on the project: if PERFECT skin tones aren’t important for the project, the you can get away with more. I suggest going through our LED database and looking at the values from lights you know to use as a gauge of what is good enough for you. Thanks so much for the comprehensive reply! Great info. From what I read, CRI is calculated by comparing the color properties (or rather reflectance) off of the 8 panels to a reference source. The reference source is either sunlight spectrum for light sources with CCT at or above 5000K, or simply the corresponding blackbody spectrum for light sources with CCT values less than 5000K. For example, the CRI of a white LED with a CCT of 2000K is relative to a 2000K blackbody radiator spectrum. It seems relatively common to find CRI values of ~ 80 for 2000K CCT White LEDs, yet the color quality off of the 8 CRI color plates is terrible (also terrible off of the MacBeth color plates). And while, by definition, the CRI value of a 2000K blackbody radiator is 100, the color quality off of this reference is also horrible (any color you want, as long as it is a shade of amber). I would appreciate your thoughts on this aspect – it seems to me that when describing CRI, you need to follow it up with the reference source, so that one can understand the color properties of the reference source itself. You are absolutely correct. We go into much deeper detail in our article Understanding the LED Database, which obviously is paired up with our database of over 165 LED lights. (When you say 2000K did you mean 3000K? I’ve never seen any light that has a CCT of 2000K.) An important thing to note is the difference between CRI (Ra) which only averages 8 colors, and CRI (Re) which averages 15 colors. The added colors greatly can influence the final value because the colors are much more relevant. Also, be sure to check out our article on Understanding Bicolor LED Lights. We dig a little deeper into color qualities and reference sources there. Thanks for your response. I did indeed mean 2000K. Such LEDs have become available to the lighting industry over the past year. This week I have written a program that shows the visual appearance of either the MacBeth Color Checker or the 8 CRI color panels upon exposure to any lamp or light source. For me, seeing the visual appearance of these color panels is more instructive than the CRI number. Prior to seeing the visual appearance, I would have thought that a 2000K White LED has reasonable color quality because the CRI value is quite high (north of 80). But when I look at the appearance of these color panels using a blackbody radiator at 2000, 3000, 4000K, D65 (all of which has a CRI = 100), I begin to see the problem not referencing the reference spectrum. Looking at these panels was what drove me to find your website, and submit my question. Thanks for your references to other parts of the website. I will check them out today. Your program sounds interesting. I agree that seeing the visual results is so much more beneficial than just a value, especially when that value is an average of a numerous other values. 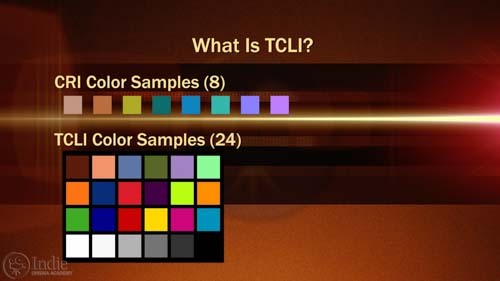 That is a big draw for TLCI’s method of reporting color quality. TM30-15 is also very informative with its method of reporting results. I’ll have to check out the 2000K to see what is up. I`m on budget (like really) but I want to get some light to make chromakey-based videos at home. 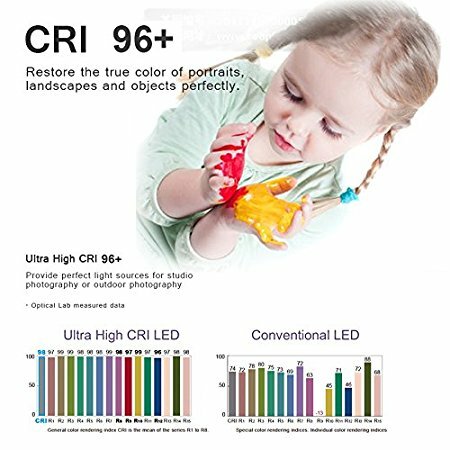 I had a chance recently working with professional lights that I got for my chromakey only for 1-time job, it was 2 halogen projectors, the result surpassed all my expectations, however I don`t want to have halogen projectors for several reasons, so I`ve found some construct lights LED with CRI 85. I watched your video and understood that CRI is irrelevant anymore, but still can you recommend smth for my case? SHould I buy those LED Projectors? Very good question. CRI is irrelevant to a point, but if you know what you are looking at it still can be useful. 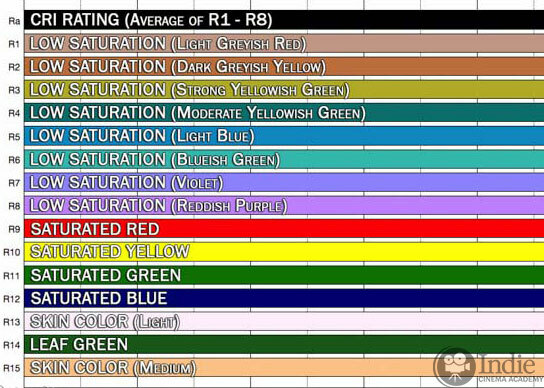 I completely ignore CRI (Ra) values since all of the important colors aren’t included. Instead I look at CRI (Re) which is the average of the R1 through R15 values. Specifically with LED fixtures, I look at R9 (which is saturated red) and R12 (which is saturated blue) since LEDs have a very hard time with these colors. Part of it is that R9 requires a very expensive phosphor, and a lot of the cheaper LEDs don’t use that phosphor to keep costs down. As for which LED we would recommend: there are a lot of good LEDs out there, and a lot of poor quality LEDs. And cost isn’t always something to measure them by since some great lights don’t cost much, and some expensive lights aren’t that great. We created an LED database to compare all of these, and we highly recommend you looking through it to find what you are looking for. Currently there is around 200 fixtures in the database, and we have more than 200 more that we are still processing and will be including in the coming months. can you also measure CRI on televisions with spectrometers like the C-700? You can definitely try. I have done it a bunch of times. The tricky part is getting a truly white screen. 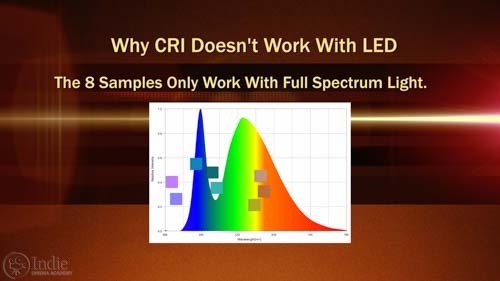 You can’t measure CRI on something that isn’t white, since the software has to be able to compare multiple wavelengths to determine a CRI value. What I’ve done in the past is measure my monitors and see what type of spectra I get from them. This in itself is very informative, telling the quality of the CFL or LED that is illuminating the screen. This is awesome. I so appreciate your work on the database. As a budget filmmaker and corporate videographer, I’m very interested in the lower priced LEDs especially popping up this year; would you be open to testing popular lower cost lights, ie. These values are too good even for high quality, high end LEDs. 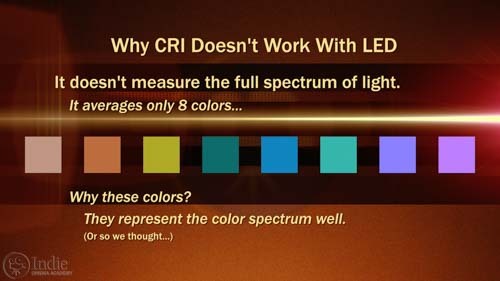 In this graph they are claiming CRI(Re) of 98, with the two most difficult colors for LEDs to reproduce (saturated red, R9 and saturated blue, R12) being 97 and 96, respectively. In comparison, even the top lights in our LED color quality database don’t achieve these values even LEDs that are thousands of dollars. Understandably, I doubt this graph from Neewer VERY MUCH! The second issue is flicker. A lot of the low end LED fixtures have major flicker problems. One commenter on the Neewer LED says that flicker is at 70Hz. That is too much flicker. Flicker needs to be up in the thousands of hertz to not be an issue. Even for very slow shutters, the issue of rolling shutter found in CMOS sensors will create banding within the image, as well as strobing if the camera is panned, tilted, or moved in any way. A similarly priced LED light that I would recommend is the Aputure Amaran 528C Bicolor light. We haven’t used this specific model, however we have always been impressed with the color quality and lack of flicker from all of Aputure’s products. Another low cost LED from Aputure that we have tested extensively is the Aputure Amaran 672W. It has a very respectable color profile for the price, although keep in mind that this model is daylight-only.